I’ve had a popover pan for years. Literally years. I received the pan as a gift from one of our favorite people after he’d spent a summer “nannying” his niece and nephew on the East Coast. They’d made a trip to Acadia National Park where they supposedly serve world-famous popovers - or at least make some extra cash selling popover pans as the perfect souvenir. Of course, I LOVED the gift (if I recall, this particular friend also brought some high-quality, uber crafty beer, a gift we were pleased to receive, yet an area of indulgence we’d yet to foster - a foreshadow of beer love to come I suppose). I was certain I’d be busting out the best popovers in a matter of weeks. However, as time often does, time for my goals/plans/desires eluded me. I found a home for the pan, read over the attached recipe and then forgot all about them or relegated them to the “some-day” pile. Before “some-day” arrived, life was calling us overseas, implying that many of our beloved belongings were to be boxed up, stored and saved for another, yet undetermined life. Fast forward through the Korea years and the settling into business owning life as a Burlington-ites, where this ever-present popover pan sits in my awkward pantry, reminding me of the things I once planned to conquer in the culinary world. A little pantry re-organizing brought the Popover pan back to the forefront of my mind and soon the Popover pan weaseled it’s way into the Culinary Goals of year 2016. I did a bit of Pinterest searching and read up on Popovers. 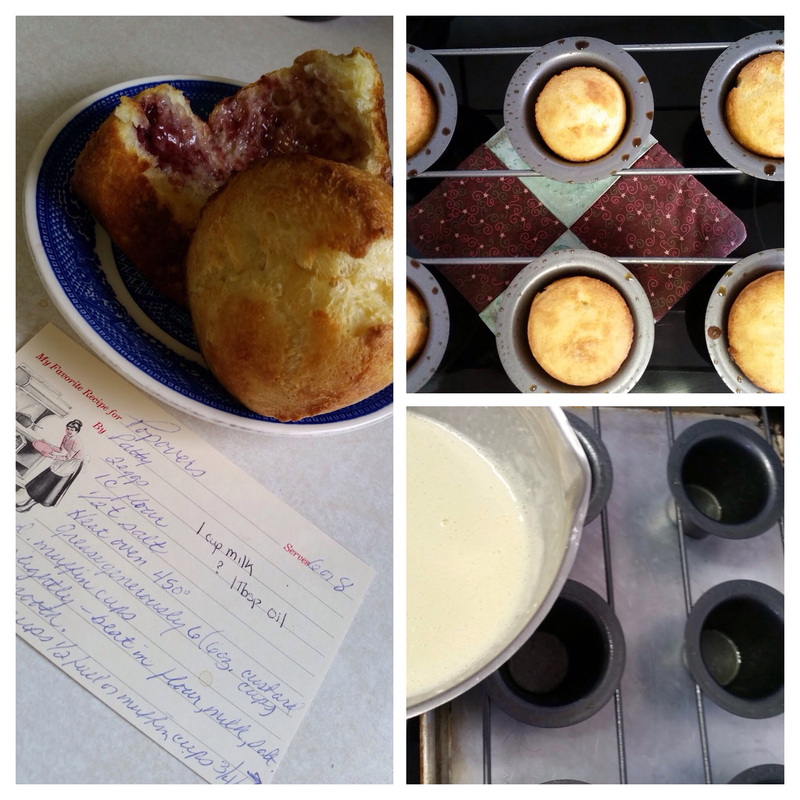 But THEN, I was on the hunt for a recipe box recipe to prepare in January and came across of recipe for Popovers from the kitchen of my dear mother-in-law. I eventually learned that Mike would frequently request Popovers as a reward for good grades, important moments, etc. 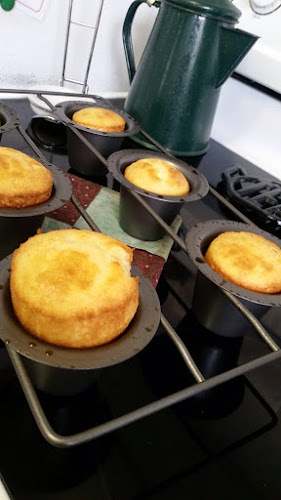 Thus, with great anticipation I set about preparing the Popovers of Mike’s youth. Fortunately, I’d read up on enough recipes to realize that the recipe, as recorded on the recipe card I had on hand, was short on ingredients and could surely not produce the fluffy, airy, custard-y cup I desired. I compared the recipe card to the recipe from Better Homes and Gardens and quickly realized the missing ingredient was milk, an easy add-in and an easy enough ingredient to add to the recipe card. With ingredients and motivation confirmed, I set about making popovers for the first time. The results were simply perfect. Served hot with melty butter, boysenberry jam and hard chai lattes I understood completely the perks and allure of this simple breakfast item and will not hesitate to throw a batch of these together on future brunch occasions.